Successfully Added Wireless 720P IP Camera - 1/4 Inch CMOS Sensor, 70 Degree Angle, Mobile Phone Support , Motion Detection, SD Card , IP66 to your Shopping Cart. Secure your home, office or other property with a wireless surveillance camera featuring 1280x720 resolution, a 1/4 inch CMOS Sensor, 170 degree wide angle, night vision, motion detection and more. 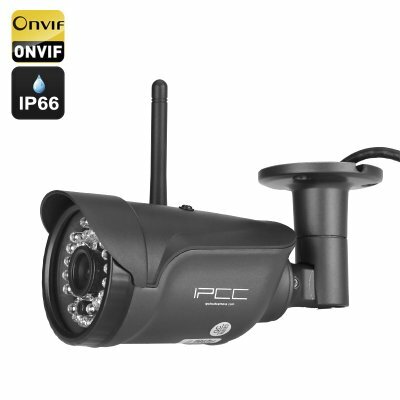 Prevent break-ins and burglaries by installing a wireless IP camera — a simple yet effective tool to deter intruders. It’s been proven that a mere sight of a turned on camera surveying the property can scare away burglars and thieves — whether in a residential property, office building or storage facility. This wireless IP camera can provide you with HD footage of what’s happening on your property thanks to the 1/4 inch CMOS sensor, can also snap quick quality shots. A 70 degree viewing angle ensures that you won’t miss any activity taking place in the background and you will have a clear open view of the surveyed property. The 720P IP camera comes with motion detection. You can set up a detection area and should any activity be spotted, the cam will take an instant snapshot of the area and email it to you — as well as record the footage onto an biolt in SD card. Thanks to 36 built-in IR LEDs, this waterproof surveillance cam offers a clear view of the area even after dark and boasts night vision for up to 15 meters. With Android and iOS support (iOS 7.0 and Android 4.3 above), you can receive and view the cam’s footage right on your smartphone. You can install the camera both indoors and outdoors. Featuring IP66 waterproof rating, the camera is resistant to outdoor elements and is even protected from powerful water jets. The cam comes with everything you need to set it up and the installation is super quick and easy. The Wireless 720P IP Camera comes with a 12 months warranty, brought to you by the leader in electronic devices as well as wholesale IP cameras..